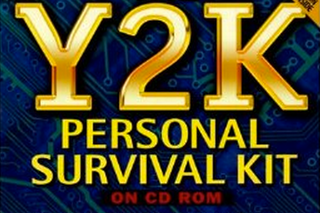 How Did You Prepare For Y2K? We live in a world obsessed with the threat of terrorism. But fifteen years ago, the media was in constant hysterics over Y2K, or "the Millennium bug." A real coding error that required many a fix, Y2K also provoked outsize paranoia and survivalist tactics that anticipated the end of the world. What were you up to? Y2K worries weren't unfounded. The common practice of abbreviating years in programming and data storage into two digits sparked a crisis when it became apparent that rolling over from '99 to '00 would make the year 2000 read as 1900 to many systems. Though the problem had been identified by technology specialists for more than a decade prior to 2000, it was the late '90s that saw a frenzy of companies working to update their software. This was best immortalized in pop culture by the brilliant cult film Office Space, whose miserable workers were on the job of going through code line by line to correct the error. JOANNA: And, uh, what do you do there, Peter? PETER: I sit in a cubicle and I update bank software for the 2000 switch. PETER: You see, they wrote all this bank software and to save space, they put 98 instead of 1998. So I go through these thousands of lines of code and uh, it doesn't really matter. I, uh, I don't like my job. I don't think I'm gonna go anymore. PETER: I don't know. But I really don't like it so I'm not gonna go. I'm gonna have to ask you to go ahead and watch Office Space if somehow you have not. You will thank me later. But let's talk Y2K. Real issues aside, there's no doubt that the media helped maintain a steady drumbeat of fear-mongering in the lead-up to the New Year. Officials in nearby Miami-Dade County are asking residents to have enough food and water stored up for 14 days, which would see the area through a disruption similar too that caused by Hurricane Andrew in 1992. I was a teenager when we reached the Millennium, and though I wasn't afraid of the world ending, my family had taken a few necessary precautions — candles and bottled water, in case the electricity went off. I remember climbing up to the roof with my best friend when midnight struck to look out across the neighborhood, hoping to witness a blackout or a collective freakout. But nothing happened. The lights didn't even flicker. The Y2k apocalypse was averted, and these days it seems almost a quaint sort of crisis. A year later later I would stand on the same rooftop and watch the smoke pouring out of lower Manhattan where the Twin Towers once stood. These days the media is still in fits over threats to our safety, but our new outsize fears are much more brutal and sometimes terrifyingly real. So a retro throwback to simpler times can feel cathartic. What did you do to prepare for Y2K? Did you, or anyone you know, have a bunker? Or were you a Peter, working your way through lines of code, bored with the rampant speculation? What's the most ridiculous piece of Y2K-related nostalgia you can dig up on our still-intact world wide web? Tell us in the comments.